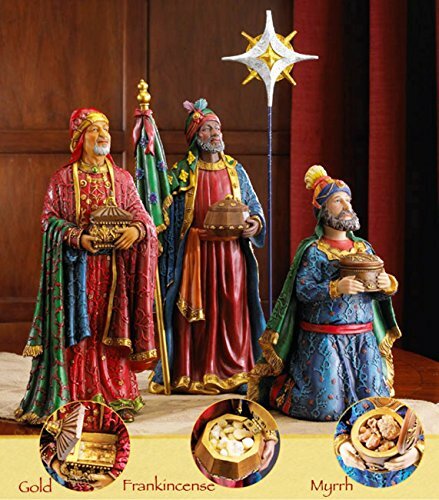 These richly colored figures of Melchior, Balthazar and Caspar bring the Three Kings to life like never before. The figures are regally adorned in bright colors and dramatic detail. Designed to be part of the Real Life Nativity or to stand apart, these cast resin figures show the Magi as they gaze towards the Christmas Star on their journey to Bethlehem. Each of the life-like figures carries a chest that opens to reveal the Original Gifts of Christmas - real Gold, Frankincense & Myrrh. The Christmas star rises from a gold & silver base on a rod dotted with flecks of stars in the night sky.